The first evidence of the Mahari institution in Orissa comes from a commemorative inscription by Udyota Kesari, the last King of the dynasty. (Patnaik 30-35). In 10th century A.D. the King�s mother, Kolavati Devi, dedicated temple dancers to Lord Shiva in the Brahmeswar Temple. King Anantavarma Chodagangadeva appointed dancing-girls for ritual services in the Jagannatha temple in 11th century A.D., and these Maharis were the ones responsible for keeping the dance alive for centuries. Through the technique of unequal division of weight and firm footwork balancing a fluid upper torso, the dancer achieves a sensuality that is uncommon in other classical dance styles. The Mahari dance is a perfect vehicle for the balance of sexuality and spirituality, as required by Tantrism. Dungri Mahari (Harapriya) in the above Photograph, and her son-in-law, Padmashri Guru Pankaj Charan Das, taught Ratna Roy Orissi dance. Harapriya�s mother was Dimmi (Domi) Mahari, and Domi Mahari�s mother was Moni Mahari. 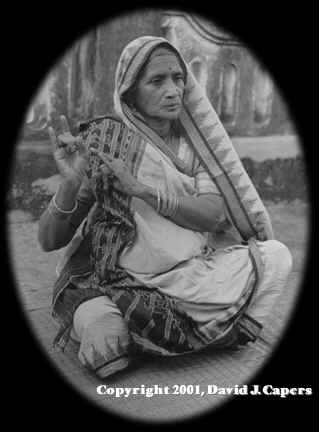 She was born in Marichikata Lane, Kundaibenta Sahi of Puri District.